Hip-hop's original Internet darlings ring in the new decade with a final, bittersweet farewell. After Little Brother tried and failed to reconnect with fans sans 9th Wonder on 2007's Getback, things looked bleak for the former trio. After all, Phonte had successfully pulled off the could-have-been-a-gimmick Foreign Exchange with Frenchman Nicolay, and Big Pooh seemed accepting of his Phife Dawg status, taking on more and more guest roles as time went on and performing well on all of them. But fans felt that something was left to be said by the group, and, around the time of Baatin's passing last summer, rumors began to swirl about a possible reunion. Phonte was fresh off a Grammy win for his sophomore Foreign Exchange LP (surprisingly, a completely R&B/soul album rather than hip-hop) and 9th was busy a-Twittering about reunions and appreciating what you have while you have it. Things could not have come together better for the group, but alas, it was eventually not to be. Drama ensued, all of which can be followed on Phonte's and 9th's Twitter and YouTube accounts rather than rehashed here. But suffice to say LeftBack ended up much like Getback: a refreshing new dose of Little Bro love, but equally roughshod and disappointing. The album starts off strong with what should have been a closer, "Curtain Call". Not only is it one of the few tracks where Pooh outshines Tay ("Guess they weren't ready for the real on the reel"), it's backed by an incredible beat that's two parts King Geedorah, one part 9th Wonder, courtesy of Khrysis. The meat of Justus League's production output and premier 9th Wonder understudy, Khrysis carries the majority of LeftBack and supplies his usual energetic version of 9th's signature Fruity Loops concoctions. There are also great offerings from former Slum Village/Black Milk associate Young RJ ("What We Are"), like a go-go beat topped with some generic love raps from the group and Zo!. The dope re-arrangement on "Two Step Blues" forgives the fact the song also appeared on Getback, while another rehash comes the track before. Symbolyc One of Strange Fruit Project quickly became somewhat famous for his work on Kanye's new single "Power", but he and his partner Caleb provide a new take on "After the Party" that isn't as refreshing, even if it certainly fits the feel of LeftBack. Given the couple of remix tracks, a somewhat awkward sequencing that sees all the neo-soul, typical Justus League songs appearing in the middle of the disc, and the two rappers' obvious eagerness to get back to their solo tasks, the majority of LeftBack is actually a bit of a triumph. Getback never struck me like their previous releases had. 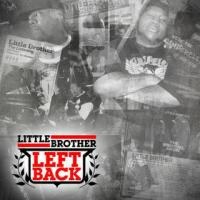 Suddenly, Little Brother felt like any other rap group (say, Tanya Morgan) and lost the cohesive luster applied to releases like The Listening, The Minstrel Show, and The Chitlin Circuit series. The duo don't revive that aura here, but they do stride along the path of countless other aimless groups carefully and with a well-measured amount of grace. They do well to rest on their producers' shoulders, allowing the aforementioned Zo!, Khrysis, and cameos from Detroit (RJ and Mr. Porter) to carry the load. When the verses become notable, it's usually for good reason, as on "Tigallo for Dolo" (a solo Phonte joint), which does an excellent job explaining, through rapping, why Phonte will no longer rap much at all. LeftBack is certainly an album with its problems, as any release with such a tumultuous history should expect to be, but it's also a healthy listen. Come for Little Brother's final farewell, stick around for the backdrops.